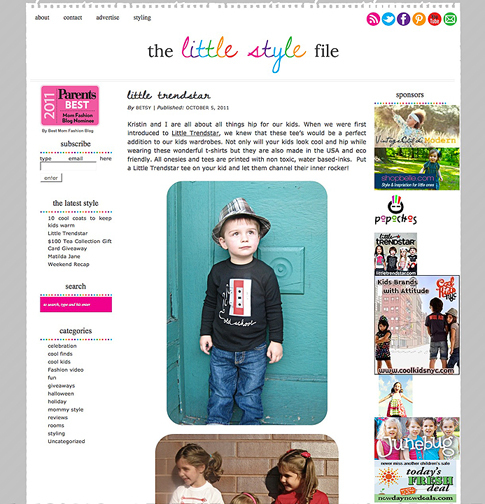 The Little Style File really knows how to show off Little Trendstar tees! When we found out The Little Style File wanted to do a photo feature using Little Trendstar tees we were more than excited. We are huge fans of the blog and couldn’t wait to be showcased on their site. After a photoshoot in Chicago, with their own kids respectively, they presented a fantastic photo journal. The kids looked amazing wearing our tees and we loved the styling that the girls had done. We couldn’t wait to share this with you and if you follow this link, you’ll be able to see all of the great images they took! « Modern Day Moms showed how cool our Clash tee can look!